The precision volume spray dispenser eco-SPRAY, made by ViscoTec, is suitable for various applications in different spraying areas. The revolutionary combination of the reliable endless piston principle and a low-flow spray chamber guarantees perfect spraying of low to high viscosity fluids – with high edge definition ! The new precision volume dispenser eco-SPRAY made by ViscoTec offers a wide range of applications for low to high viscosity spray media. 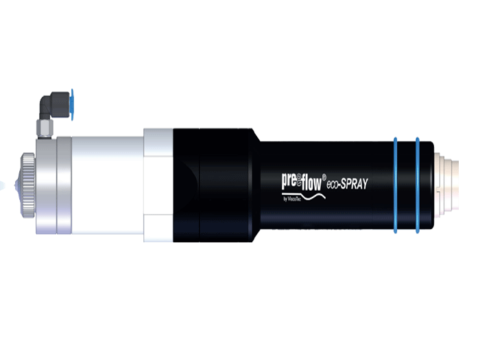 The preeflow® eco-SPRAY guarantees a volumetric spray application based on the endless piston principle. The base of this new microspraying technology is still our proven rotor/stator technology. Due to a defined rotary motion of the rotor the medium in the stator is volumetrically replaced and conveyance is created. Thus a determined amount of medium is process controlled and directed to the special low flow spray chamber. The precise nebulization and spraying can take place continuously or punctually. 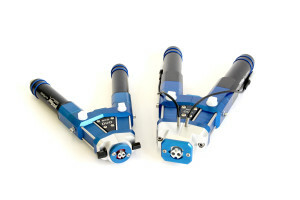 The revolutionary combination of the endless piston principle and the low flow spraying chamber guarantees perfect spraying of low to highly viscous media with high edge definition and lowest possible overspray.